From the Winter 07/08 Made in MKY Newsletter of the Kentucky Museum of Art and Craft. Louisvillian Melvin Rowe, an integral part of the Kentucky ceramics world for more than 30 years, loved creating as a child. “I’d make things out of whatever I could get my hands on: oatmeal boxes, coat hangers, scrap wood,” he says. Melvin entered Western Kentucky University to study fine art to become a cartoonist, but upon taking ceramics became hooked on that instead. He earned his B.F.A. at WKU and his M.A. in ceramics at the University of Louisville. And he still loves it. “It’s 35 or so years later, and I still can’t wait to open the kiln, to see the new stuff, the new experiments,” he says. 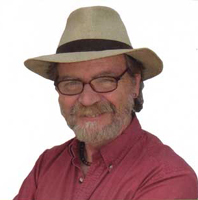 For years while creating his own work, Melvin worked full-time, including serving as director of Metro Arts Center in Louisville, and also taught part-time. 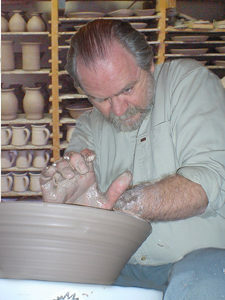 In about 1981 he was offered a job in Montana, but he chose to stay in Louisville to become a full-time production potter. “I knew I’d be better with the material if I threw 100 mugs a day rather than creating a space for others to do that,” he says. Today Melvin also sells his work through wholesale and speciality accounts. Melvin’s diverse accounts include making religious vessels for churches and mugs for local bars. “Flanagan’s on Baxter— I’ve made over 500 mug for their mug club,” he says. He also makes the mugs awarded to prize winners in the home-brewed beer competition at the Kentucky State Fair. Wine carafes and decanters are among Melvin’s favorite items to make, and he enjoys making wine as well. In 2006 he won a first place ribbon at the Kentucky State Fair for his Colonel Mel’s Green Apple Honey Mead, and this year he won a third place ribbon for his Heap Big Medicine Mouthwash and Pain Killer. Part of Melvin’s charm is a great sense of humor, which spills over into his wine labels. Melvin notes the similarity between making wine and ceramics. “The chemistry of wine making is similar to glaze chemistry,” he says. “You have to understand the ingredients and what something is going to be after going through the process.” Louisville is lucky to have Melvin going through these processes here. ** Since this article was published, Rowe has sold the Frankfort Ave. property and moved his studio to Henry County, Kentucky. “Teapots,” Stone Soup Gallery, June, 1994, Chicago, Il. Kennedy Center for the Performing Arts, September/October 1993, Washington, D.C.
“Promotions,” Craftlink, Crafts Council of Australia, Brisbane, Australia, March 1991. “Combining Retail Space with Work Space,” Craftlink, Brisbane, Australia, June 1991. “Sharing Responsibilities Can Increase Production and Profit in a Retail Shop,” Craftnews, Toronto, Ontario, 1989. “Opening Your Own Shop,” an eight month series, The Crafts Report, October l988 through May 1989. “Test Marketing,” The Crafts Report, accepted for publication September 1987. “Sales Aids Help Stores Sell Your Work,” The Crafts Report, January, 1988. “A Craftsman’s Point of View,” Made in Kentucky, a publication of the Kentucky Art and Craft Foundation, regular column, July 1984 to end of publication. “Creating Variation with a Single Base Glaze,” Ceramics Monthly, June 1981. “A Japanese-Style Handwheel,” Ceramics Monthly, October, 1980. “Converting to Oxidation Glazes,” Ceramics Monthly, February, 1985. “The Professional Crafter,” monthly column, newsletter of Louisville Craftsman’s Guild, 1985.